The TOT-5S Double Open-Top M4/M16 Magazine Pouch from 5ive Star Gear carries two M4/M16 or similarly-sized magazines as well as two pistol mags. 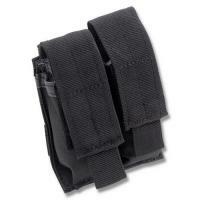 Bungee cord retention straps secure magazines, while the full hook-and-loop flap cover provides added item retention. Each slot includes a front-mounted pistol magazine holder, allowing for speedy reloads of a sidearm. Each pouch integrates easy pull tabs for rapid access to spare ammo. A metal drain grommet allows water to leak out instead of pool inside the pouch, potentially damaging contents. The pouch attaches securely to webbed platforms using reinforced universal straps, guaranteeing compatibility with a wide range of equipment.